Wulai (烏來) is a popular mountain village located in North of Taiwan, outside of Taipei main city, with majority of the residents being aboriginal people of the Atayal Tribe (泰雅族). The village is named after “ulai”, a term in the Atayal language, which meant hot spring, hence this place is extremely popular for hot springs. Beside hot springs, Wulai is also famous for its luscious greenery, high mountains, waterfalls and cherry blossoms. We were lucky to see a magnificent Wulai Waterfall the day we went there. The water falls down from the cliff from 80 metres in height, creating a beautiful fall. There were very few people around as it was a weekday, hence we have the scenery all to ourselves. Right on top of the waterfall is Yunxian Park (雲仙樂園), which can only be accessible via a cable car. It is a mini theme park but we weren’t interested to go there. The village was really quiet, so after lunch, we just walked around randomly before taking a dip in the hot springs. 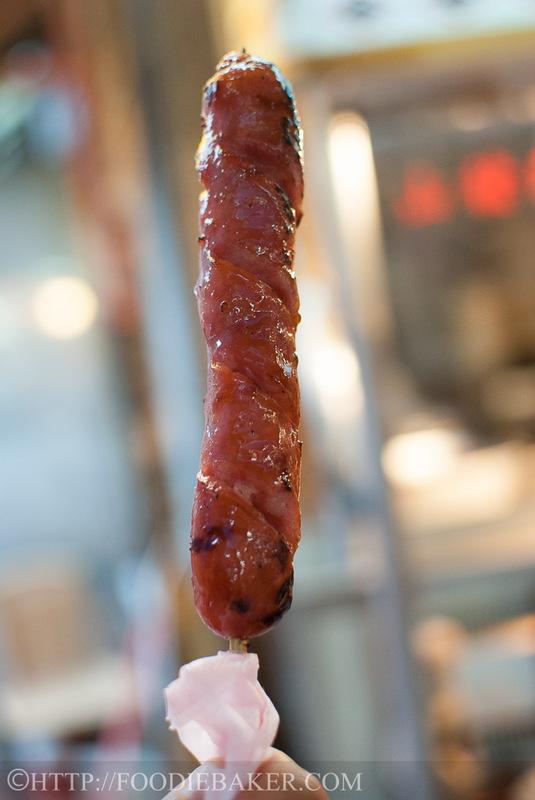 Wild boar sausage is one of the popular snacks in Wulai, and on Wulai Old Street there are many stalls selling the same type of sausage. We settled for this one, which was highly recommended by many other bloggers. Sausages ready to be grilled! See the oil glistening in the light? Gosh it was really sinful! There’s a nice balance of lean meat and fats, but to be honest, it tasted very much like the normal Taiwan sausages (台灣香腸) that I usually eat. Set us back at NT$35 per stick. 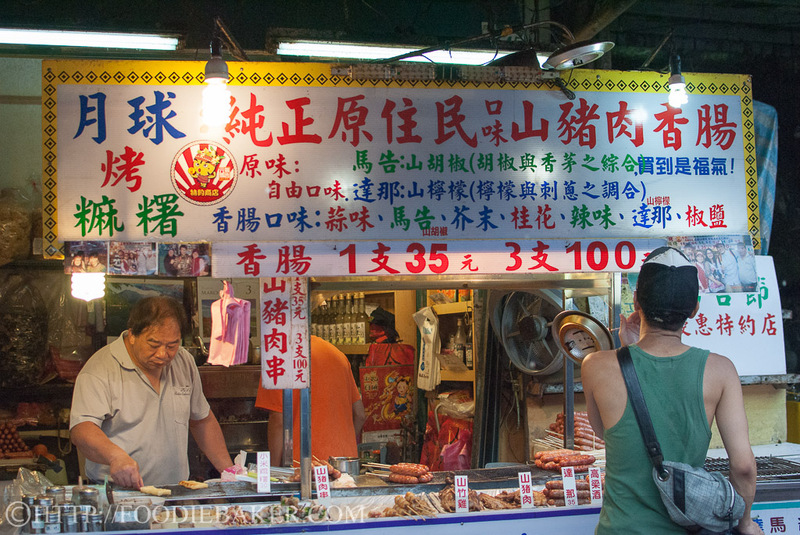 Another stall selling not only sausages, but also other grilled stuff. 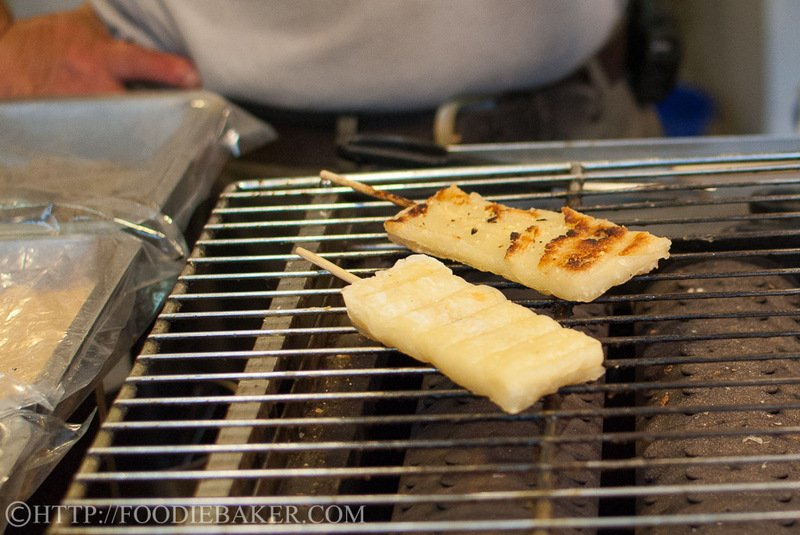 You just choose whatever you like and the boss will grill it for you until piping hot. 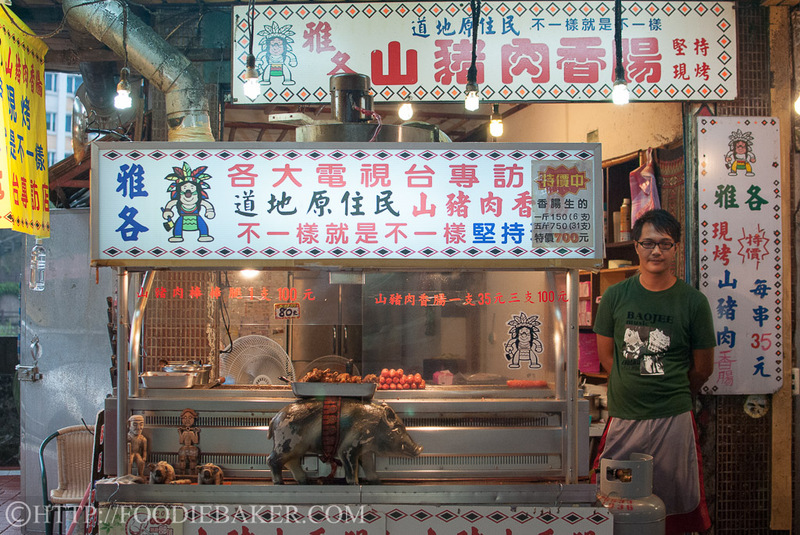 There are wild boar meat, quail, sausages, and mua-ji. 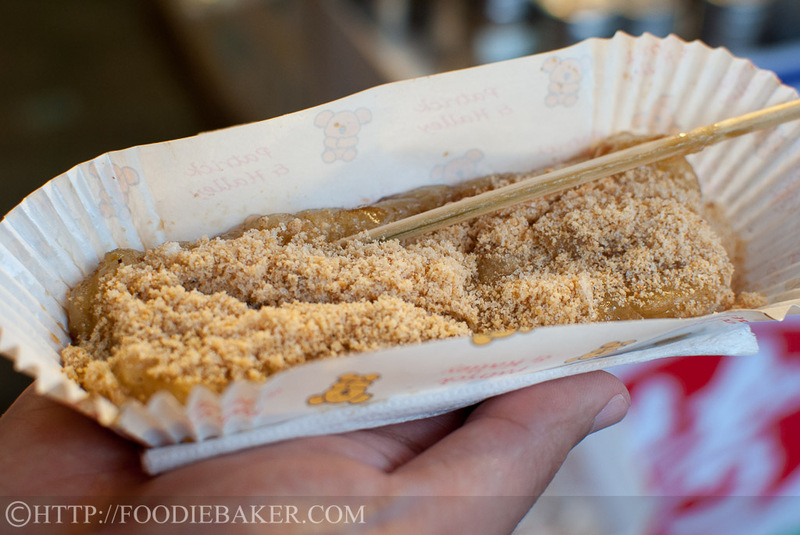 Here in Wulai, the mua-ji is grilled to make it hot, then coat it in some sweet sauce before finishing it off with a generous sprinkle of finely chopped peanuts (NT$30). A pretty delicious and sticky snack to end the day before we catch a bus back to the city. Take the Taipei metro (MRT) to Xindian Station (新店站). Upon exiting the station, there should be a tourist centre on the right. Just behind the tourist centre is a bus stop (if in doubt, just ask the receptionist in the tourist centre). Queue for the bus 849 – the bus comes every 10 to 15 minutes. Take all the way till the end (about 40 minutes ride) and bus fare costs NT$15. Sit on the right side of the bus to enjoy a nice scenic view. Taxi costs about $100 per pax, but given the cheap bus fare, I don’t think it is worth taking a taxi! 1) Upon reaching Wulai bus terminal (烏來總站), walk through Wulai Old Street (烏來老街), cross the bridge and you will see a train station. 2a) Take a little train (NT$50 per person) that brings you 1.5km up the valley. 2b) Take a stroll on the Lover’s Path (情人步道) – total walking distance from the bus terminal to the waterfall is about 2km. 3) To look for the viewing gallery of the waterfall, look for the public toilet sign, which will be next to a tourist centre / gallery. There are chairs and tables outside (which we helped ourselves to set up). A very good place to have lunch. Soaking in hot springs – there’s a free one (open air, public) and several private rooms for rent (for a couple of hours) – click herefor more information. 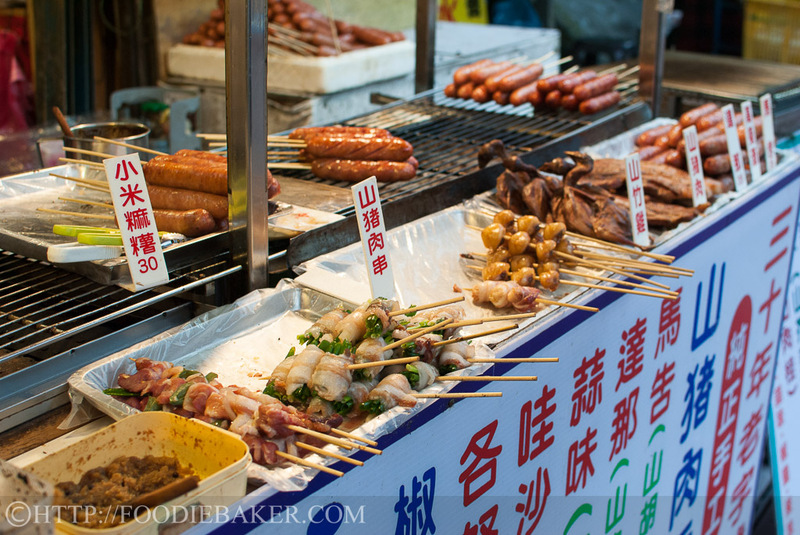 Walk through the Old Street and enjoy some of the local Wulai snacks – wild boar sausages and grilled mua-ji. 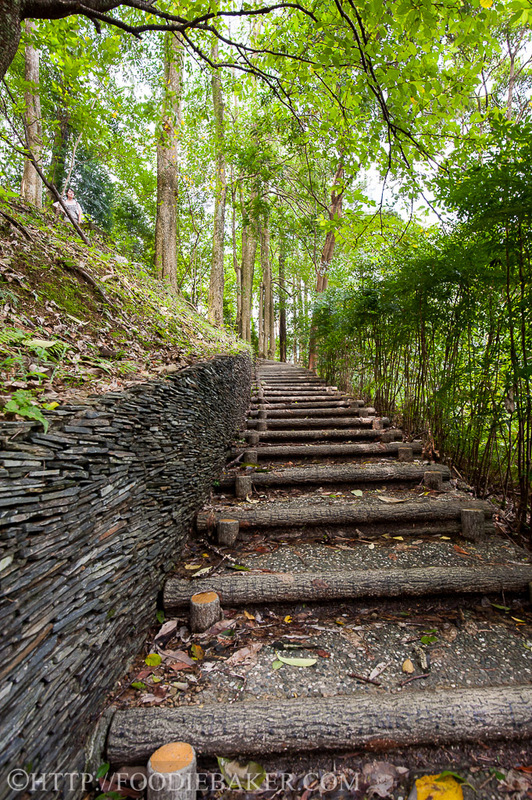 Hiking 1 – there’s a trail near Wulai called Jia Jiu Liao Trail (加九寮步道), takes about 1 hour at 2.1km. The start of the trail is at Chenggong Station (成功站), which you can read more about it here. Hiking 2 – Neidong National Forest Recreation Area (內洞森林遊樂區), more about it here, here and here. Yunxian Park (雲仙樂園) – a nature park with gardens, paddle boats, natural trails, and natural obstacle courses, accessible by the cable car – website here. We went to Wulai on a Monday in August, and majority of the shops are closed, I think the place is only more crowded on weekends. But it was a nice experience to be away from crowds. Hi! Love your detail in explaining this waterfall/area in Taiwan. 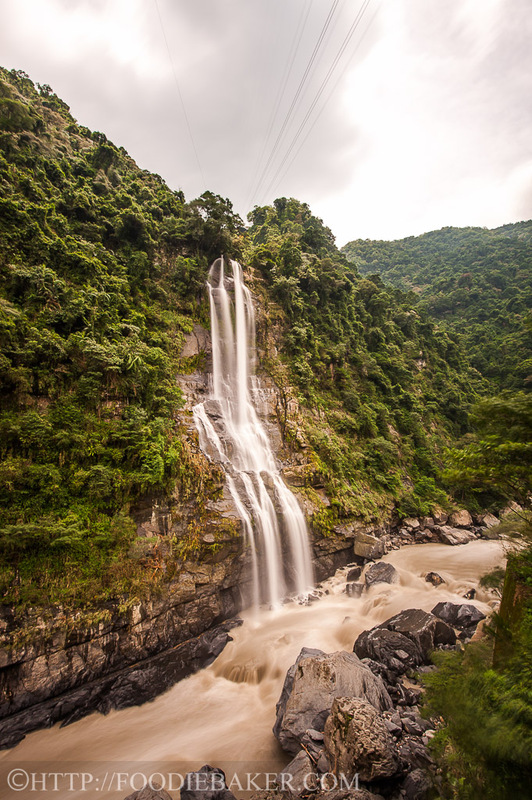 We are in Taiwan now, staying near the Qizang MRT station, so this hike/waterfall is not too far form us. Are there many hikes to do in this area? Check out our blog now. We are traveling through Asia now. Hi Julian, sorry! I don’t remember doing any hikes around that area and I’m not sure if there are any. Perhaps it will be better to ask the locals there! 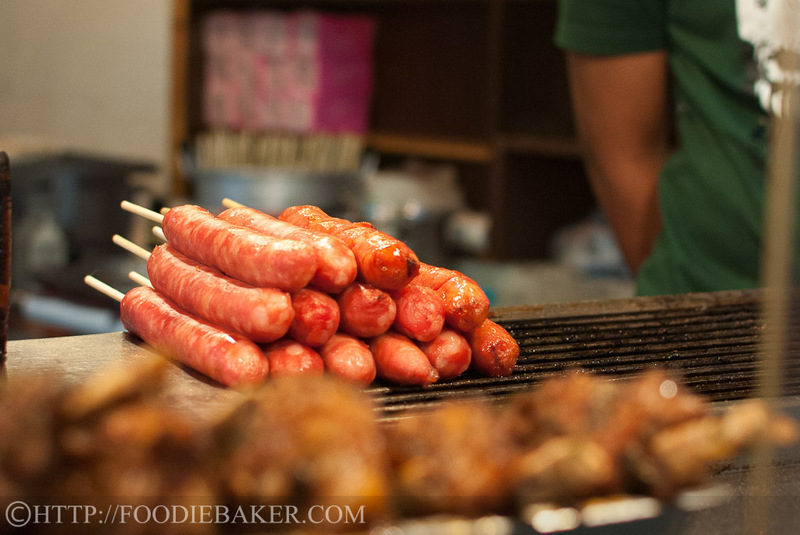 Love the idea of wild boar sausage – something I’ve never tried.